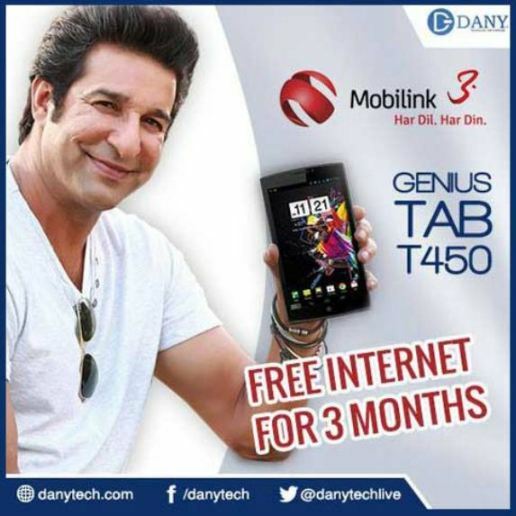 Mobilink in partnership with its customers new T450 Danny Genius tab unlimited 3G Internet access for 3 months to give a great opportunity. Just buy the tablet only exciting for Rs. For 3 months and your friends to get faster internet and cost free stay connected with family members and 17,000. New Dany Genius Tab T450 3 g daily dynamic way of life for the user and a portable tablet PC with versatile computing system is supported. This is just a modernized user you want faster quad-core processor. Right now its 6.95-inch high-resolution screen gaming fun by watching movies and enjoy yourself. With FM radio with built via GPS while enjoying your favorite melody you will never miss any way. It is stuffed with Android Jelly Bean OS 4.2.2 with 1 GB of RAM memory is a very powerful 1.2 GHz quad-core processor. It is a dual SIM compatible with 5MP rear tab. In the big screen experience with high resolution photography is amazing. It also has 2 MP camera supported a selfie. Other features include Bluetooth, Wi-Fi, FM radio, direction of seniors and 3000 mAH Li-on battery power. It has built-in 16 GB internal storage, and an SD card which can be expanded up to 32 GB..